Mash pumpkin and keep warm. In a large soup pot, sauté the onion, leeks and celery in coconut oil over medium heat for 5-7 minutes. Add vegetable stock, mashed pumpkin, and spices. Simmer for 15 minutes. Turn the heat off and add the heavy cream. Serve warm and enjoy. 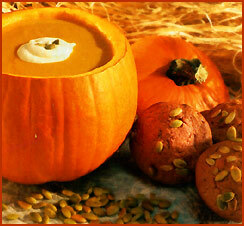 Pumpkin is loaded with beta-carotene, a powerful antioxidant. It is also rich in potassium, a vital electrolyte. The spices aid with digestion and are healing to the immune system.